Tap water should have a pH of 6.5 to 9.5, rain water can have a pH < 5. 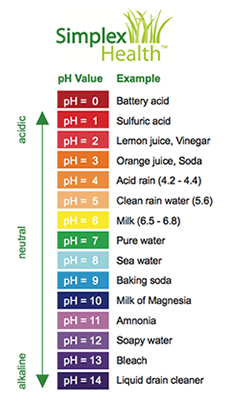 Pure water should have a pH of approx 7. The pH scale ranges from 1 to 14, these SimplexHealth pH test strips screen the full test range. Hot to use: Soak the test strip in the test solution for half a second and compare it with the colour chart. Please note: that this is a screening test and can not be used to certify water as safe or unsafe for drinking. It provides approximate results ONLY when used in strict accordance with instructions. SimplexHealth expressly disclaims any liability resulting from the use of this product, failure to follow instructions, or reliance of test results. This is not a measuring instrument. Store in a cool, dry (below 32°C) place and away from excess heat and direct sunlight. No MSDS required. Keep away from children and pets. Avoid contact of test areas on strips with skin & eyes, do not ingest or expose to acids. testing strips required for home borehole water pH testing. These came very fast. Strips are really easy to use with clear and simple instructions. Excellent. I got this because I wanna test the water regularly to keep track on how it is going. It is very easy to use and I still remembered using them from the chemistry classes. Only need to soak a test strip for a few seconds and then the colours will change. The pack bring a colour chart, so you only need to compare the colours you got with the chart to find the result. It is very easy to use and I find the results fairly accurate. Therefore I recommend this pack of pH test strips! I actually purchased these for experiments with the kids. It's a great way of them testing and understanding the varying pH's of different liquids e.g. vinegar, milk, cola, water, saliva. Easy to use just take a strip from the box and dip into the liquid, it only takes a couple of seconds to see the results which you then compare against a colour chart. Personally I use to test acidity in urine levels so I can keep track and balance out if need be. Basic test for water and other pH levels, it provides a wide range scale for readings, the colour could be a bit clearer but in general give a good base figure for working from. The process for using these is simple as placing in your test substance for approx 30 sec and wait for the color or the strip to change where you can compare it to the basic guide on the box container, although it does not provide accurate readings it does give a good overall scale of the pH levels tested. Improvement Possibilities – This section should in no way be thought of as negative, this is just ideas I had for possible future thoughts for developing the product further. 1. More accurate results scaling. Overall Verdict – Basic but easy to use pH reading strips contained in a easy to store small plastic box. These were great, simple and easy to use. Very basic but only needed for soap testing. These ph test strips give accurate results. the paper is good quality and holds well in liquid. The strips are useful for testing water and saliva when concerned about the levels and are definitely great for their use, however, I wanted test strips for testing the ph levels of my hair and beauty products in particular and these work well for this purpose. These strips come in their own handy box that keep them safe, clean and straight. The box is hard wearing and is great for popping in my bag as paper boxes often become dented and worn and also get damaged id my drink spills or the condensation causes my bag to become damp. I have had the paper roll version of and much prefer these strips.